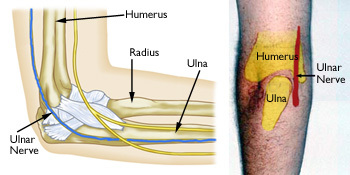 Ulnar nerve entrapment occurs when the ulnar nerve in the arm becomes compressed or irritated. The ulnar nerve is one of the three main nerves in your arm. It travels from your neck down into your hand, and can be constricted in several places along the way. Depending upon where it occurs, this pressure on the nerve can cause numbness or pain in your elbow, hand, wrist, or fingers. If you want to know if you can make a personal injury claim based on cubital tunnel syndrome, please call the Maurer Law Firm at 845-896-5295. Sometimes the ulnar nerve gets compressed at the wrist, beneath the collarbone, or as it comes out of the spinal cord in the neck. The most common place where the nerve gets compressed is behind the elbow. When the nerve compression occurs at the elbow, it is called "cubital tunnel syndrome." Check out our Personal Injury Blog for more information. Ulnar nerve entrapment can give symptoms of "falling asleep" in the ring finger and little finger, especially when your elbow is bent. In some cases, it may be harder to move your fingers in and out, or to manipulate objects. Steroid injections. Steroids, like cortisone, are very effective anti-inflammatory medicines. Injecting steroids around the ulnar nerve is generally not used because there is a risk of damage to the nerve. Nerve gliding exercises. Some doctors think that exercises to help the ulnar nerve slide through the cubital tunnel at the elbow and the Guyon's canal at the wrist can improve symptoms. These exercises may also help keep the arm and wrist from getting stiff. There are a few surgical procedures that will relieve pressure on the ulnar nerve at the elbow. Your orthpaedic surgeon will talk with you about the option that would be best for you. Cubital tunnel release. In this operation, the ligament "roof" of the cubital tunnel is cut and divided. This increases the size of the tunnel and decreases pressure on the nerve. After the procedure, the ligament begins to heal and new tissue grows across the division. The new growth heals the ligament, and allows more space for the ulnar nerve to slide through. Cubital tunnel release tends to work best when the nerve compression is mild and the nerve does not slide out from behind the bony ridge of the medial epicondyle when the elbow is bent. Ulnar nerve anterior transposition. 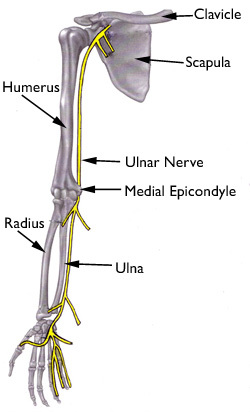 More commonly, the nerve is moved from its place behind the medial epicondyle to a new place in front of it. This is called an anterior transposition of the ulnar nerve. The nerve can be moved to lie under the skin and fat but on top of the muscle (subcutaneous transposition), within the muscle (intermuscular transposition) or under the muscle (submuscular transposition). Moving the nerve to the front of the medial epicondyle prevents it from getting caught on the bony ridge and stretching when you bend your elbow. Depending on the type of surgery you have, you may need to wear a splint for a few weeks after the operation. A submuscular transposition usually requires a longer time (3 to 6 weeks) in a splint. Your surgeon may recommend physical therapy exercises to help you regain strength and motion in your arm. He or she will also talk with you about when it will be safe to return to all your normal activities. If you or a loved one has suffered a repetitive stress injury, you may be entitled to compensation. Please contact The Maurer Law Firm by calling 845-896-5295 to schedule a free consultation with our experienced Fishkill lawyer Ira Maurer. Read our fantastic reviews: "Ira M. Maurer is a superb attorney..."